Deep optical image of the Antennae galaxies. New tidal debris is found at the northern tip. Astronomers have discovered new tidal debris stripped away from colliding galaxies. The research will be being presented during a press conference at the 214th annual American Astronomical Society meeting in Pasadena, California by Drs. Jin Koda at Stony Brook University, Long Island, New York; Nick Scoville of California Institute of Technology; Yoshiaki Taniguchi of Ehime University, Ehime, Japan; and, the COSMOS survey team. 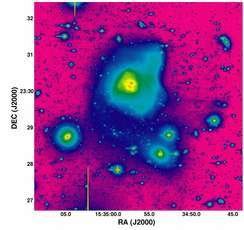 New debris images are of special interest since they show the full history of galaxy collisions and resultant starburst activities, which are important in 'growing' galaxies in the early Universe. In this study, new tidal debris were found with 8.2-meter Subaru telescope on Mauna Kea, Hawaii, which is operated by the National Astronomical Observatory of Japan. The international team took extremely deep exposures of archetypal colliding galaxies, including "the Antennae" galaxies in constellation Corvus (65 million light years away from us), "Arp 220" in constellation Serpens (250 million light years) and "Mrk 231" in constellation Big Dipper (590 million light years), and 10 additional objects. Often seen in public media and textbooks, these galaxies are well-known galaxy collisions. 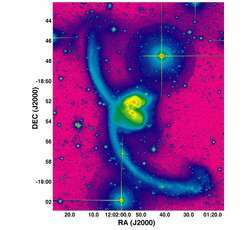 Deep optical image of Arp 220. New tidal debris is seen as the southern extension --doubling the size of the object from previously-known. "We did not expect such enormous debris fields around these famous objects," says Dr. Koda, Assistant Professor of Astronomy at Stony Brook University. "For instance, the Antennae - the name came from its resemblance of insect ‘antennae’ - was discovered early in 18th century by William Herschel, and has been observed repeatedly since then." Colliding galaxies eventually merge, and become a single galaxy. When the orbit and rotation synchronize, galaxies merge quickly. New tidal tails therefore indicate the quick merging, which could be the trigger of starburst activities in Ultra Luminous Infrared Galaxy (ULIRG). Further studies and detailed comparison with theoretical model may reveal the process of galaxy formation and starbursts activities in the early Universe. "Arp 220 is the most famous ULIRG," says Dr. Taniguchi, who is Professor of Ehime University in Japan. "ULIRGs are very likely the dominant mode of cosmic star formation in the early Universe, and Arp 220 is the key object to understand starburst activities in ULIRGs." "The new images allow us to fully chart the orbital paths of the colliding galaxies before they merge, thus turning back the clock on each merging system," says Dr. Scoville, the Francis L. Moseley professor of astronomy at Caltech. "This is equivalent to finally being able to trace the skid marks on the road when investigating a car wreck." According to Dr. Koda, the extent of the debris had not been seen in earlier imaging of these famous objects. "Subaru’s sensitive wide-field camera was necessary to detect and properly analyze this faint, huge, debris," he said. "In fact, most debris are extended a few times bigger than our own Galaxy. We were ambitious to look for unknown debris, but even we were surprised to see the extent of debris in many already famous objects." Galactic collisions are one of the most critical processes in galaxy formation and evolution in the early Universe. However, not all galactic collisions end up such large tidal debris. ‘The orbit and rotation of colliding galaxies are the keys," says Dr. Koda. "Theory predicts that large debris are produced only when the orbit and galactic rotation synchronize each other. New tidal debris are of significant importance since they put significant constrains on the orbit and history of the galactic collisions."